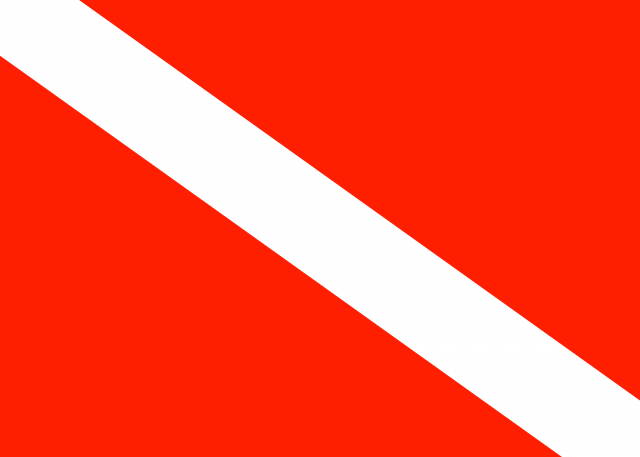 The now-familiar red-and-white dive flag was invented in the early 1950’s by Denzel James “Doc” Dockery from Michigan. After his discharge from the US navy in 1949, Doc took up the fairly new hobby of diving using a home made SCUBA rig he manufactured from a plan published in “Popular Mechanics”. He had been using the US Navy solid red “Baker” or “Danger” flag, but he soon realized that marine traffic did not recognize it. so he and his wife Ruth created a red flag with a horizontal white stripe in the middle. One small problem, that’s the national flag of Austria. Ooops! so, he and Ruth decided to sew a diagonal white stripe from corner to corner. Viola, a flag was born. Although not an “official” flag, the “Diver Down” flag, as it is called, is used around the world by almost all recreational scuba divers. Since 1997, nearly every state in the USA has written laws requiring the use of a dive flag.